While technically melittology is a branch of entomology, the scientific study of insects, I’m loosening the strict definition here as I ponder my own study. My love of bees has led me over the years to intriguing obscure facts, symbolic meanings, and folklore. In Greek mythology Melissa was the nymph who discovered and taught the use of honey, and honeybees were named after her. 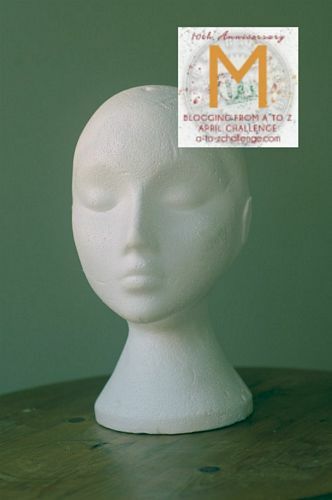 Minoan-Mycenaean priestesses were called Melissa. According to Homer, Apollo’s gift of prophecy first came to him from three bee maidens, and of course the Delphic priestess, the Oracle was often referred to as Bee. The ancient Egyptian book of Am-Tuat compares the voices of souls to the hum of bees. And Pythagoreans revered bees as sacred creatures of Aphrodite who knew how to create perfect hexagons in their honeycombs. Incidentally these very units of the honeycomb, the hexagonal cells, have walls that are only 2/1000 of an inch thick, and yet are able to support 25 times their own weight. According to both ancient Veda texts and the Greeks, lips anointed with honey brought the gift of eloquence. Bees are critical to ensuring global safety of the food supply chain. Bees pollinate 71 of the 100 crops that make up 90% of the world’s food supply. That is nothing less than astonishing. It’s no secret that bee populations are in danger and have significantly decreased. 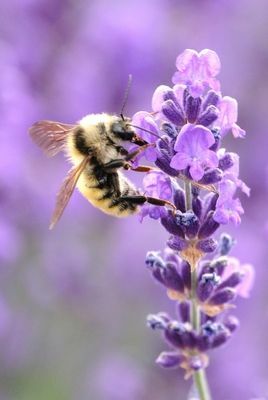 The use of harmful chemicals, particularly the neonicotinoid pesticides, along with loss of habitat, and climate change are challenging bee survival. 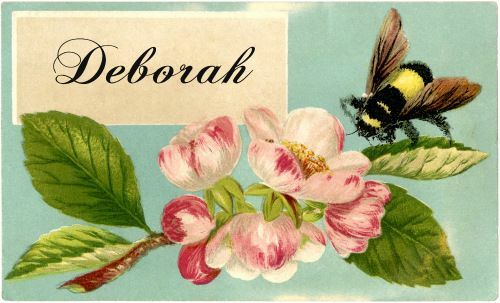 Undoubtedly I’ve mentioned it a million times because it delights me so much – my name, Deborah, means bee. It also delights me that my first and last name anagrams into things I love. I am “Wore Herb Bead” – and I can attest to that fact. I love making herbal beads and wearing them. I am also “Adore Herb Web.” Yes I do. I think of the botanical world as a beautiful web of flowers and herbs and trees and all manner of magic, and I love it all. And finally I am “Hoard Bee Brew.” It’s true I love honey – I only hoard it in the sense I love having it around. I’m happy to share. But I also like thinking of this moniker as an admonition to be mellifluous, which has as one of its original definitions “filled with something that sweetens.” I’d like my life’s contribution to be that. that's all. What did you expect? Sophistication? Many cultures across the world bees are regarded as sacred beings, and frankly I think, melittology aside, it only takes a few moments of genuine observation of amazing creatures to understand this whole-heartedly. Are you fascinated by bees? Love honey? Ever anagram your name? Do tell – you know I’d love to hear. I like bees and LOVE what they do in this world. However, I don’t like them in my house or my car. And I’m not a fan of honey. I’m sure bees love your garden Margaret, and hopefully are happy to stay out there to enjoy the treats. Every time I see a bee I think of you! Fascinating creatures…all of you! Well, of course I love bees! Anyone who eats needs to love bees! I grow lots of flowers, herbs, and seasonally vegetables, so I need pollinators. I was always the “weird” girl who rescued bees that fell in swimming pools, and let them dry off to fly away, instead of stepping on them, screaming that they’ll sting me. I like honey. Not enough to always have it around, but that’s more due to the cost. There is local honey to buy, which is very nice. I love baklava, and what would that be without honey?! My name only anagrams to “ails.” It’s too short to do much. Kudos for bee-rescuing, and yay for all the bee-loving Lisa, aka Sail. Ha, I never thought of Sail, and the online generator only had Ails! Good for you, and silly of me not to see it. In English we call people honey-tongued instead of honey-lipped, but obviously the idea behind it is the same. I love the idea of souls murmuring like the hum of bees. I love both honey-tongued and honey-lipped, both literally and figuratively. Lovely post Deborah. In summer months and swimming in the pool, we often rescue bees that have fallen in and put them on the paving. It’s lovely to see them shake their wings and fly away. I’m always excited when I see bees in my garden .. I’m so aware of the possible extinction of them or the waning of them. Your photos are lovely, thank you! And yay for uncovering a Bee in Elizabeth. It’s a delight to find them wherever we can. There are bees and then there are bees. Carpenter bees are a pain in the neck. Well John, I can definitely appreciate your perspective. But carpenter bees are also pollinators and welcome in gardens. If given a supply of soft wood to nest in they likely won’t bother the wood you want to protect. So should we all now call you, Wore Herb Bead? I rather like it, but perhaps it’ll take a while for it catch on. I like bees, both how they look and the honey they make. You can bet I’ll answer to that Ally, but you’re right it may not be the most catchy. Oh well, I might claim it as a secret name and only super-special friends know it. That might be an incentive for it’s adoption. 🙂 And how fabulous would it be if when I wore one of my herb beads a bee decided to travel along with me for a bit – I’d love that. I’m also a fan of bees. We’ve been working on planting more pollinator garden flowers in our yard to help them along in the hard times they’re facing now. Perfect Samantha – the bees will appreciate it, your garden will love it, and you’ll get the enjoyment of happy bees and flowers. Win-win-win. Deborah ~ Bees are amazing creatures in service to life. I may be a little afraid of them, but I’m in awe of the necessary role they play. To share a name with such a life-giving, truth-speaking creature is a gift in itself. Also a lot to live up to! Having been stung twice in my life, both times when I got too close and accidentally touched one, once as a child while walking barefoot in the sand and the other time while closing a window, I’ve learned to appreciate their wonderful gifts while maintaining a safe distance. It didn’t matter that I hadn’t meant them any harm, or even that in stinging me they brought death to themselves. Instead, they were acting on their natures, sacrificing their lives in defense of queen and colony. Kind of interesting how only female bees sting. I’ve read where in some ancient cultures, the queen bee (and/or bees) were associated with the Great Mother. But as is true in any extreme, there’s a point of saturation, where whatever remains hidden in the unconscious finally makes itself known and a thing becomes its opposite. It’s been a couple of years since I read Woodman’s book. Last night I decided to revisit it and happened to turn to the dog-eared page containing the above quote (which I’d highlighted and underlined) and immediately thought of you and your J post. I think that’s how the trickster works, sometimes by creating psychic loops and a series of synchronicities as a way of capturing our attention. It’s so interesting the things that mark us, and your dance with bees is certainly intriguing LB. I’m utterly fascinated though by the synchronistic re-discovery of the Woodman quote you’ve shared. Janus may be guarding my doorways, but you’ve definitely flung open a few for me, and I’m happily stepping through in a mission of discovery. Thank you. Adding how your choice of the word “dance” in describing my relationship with bees is timely and meaningful. I wonder if you’ve read my latest comments left in response to Susan Scott’s post yesterday, which were composed before I read your reply. I hadn’t seen your responses to Susan’s post, but have remedied that now. It all makes me smile, as though we’re all dancing on the taut strings of some cosmic instrument playing a most remarkable and engaging song. This is quite a hobby, I like reading about old historic folklore, stories, and other stuff. 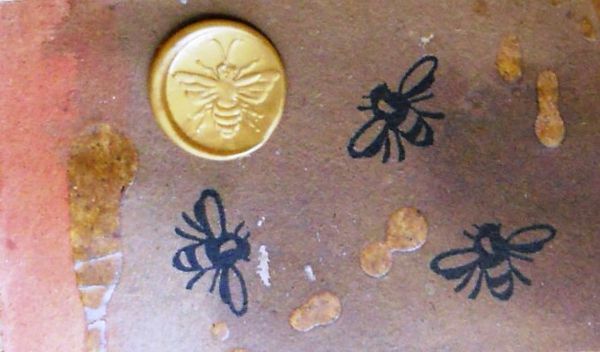 These details about the bees is new for me, and glad I read it here on your blog. I’m hopelessly fond of folklore too Dipika. Thanks so much for stopping by. And I have no doubt you know the very best tales about them! I know I need more bees in my garden. So much less fruit set this year. I need to try more flowers perhaps. I’m a honey fan. A friend had hives however moved so I miss their farm honey. Choosing bee and pollinator friendly flowers for your garden can be a fun thing, and hopefully your fruit trees will prove happier in the future. It’s lovely to have friends who can share their honey – what a delight that must have been. While I don’t have access to that, we have a number of local sources that make it easy to purchase from neighborhood farmer’s markets and my CSA sources local honey as well. I always find it a joy to try different honey and get a taste of what the bees were enjoying. As always – lovely post! Glad that you have emphasized the importance of bees as a pollinator. They sure play a very crucial role in the global food market. I too love honey. I like having a spoonful or two of honey every day. I enjoyed the association of bees with folklore. I have never tried anagram for my name but I will try. Also, you have 3 very interesting anagrams for your name. I don’t know why I find anagrams so delightful, but I can’t deny it. And I’m always happy to find a kindred honey lover. We’re lucky to have such sweetness to indulge in.